Chinese seal engraving is not just about engraving but rather is a perfect combination of calligraphy, composition and carving. This is truly an art that is capable of “containing many a spectacle in a square inch”. 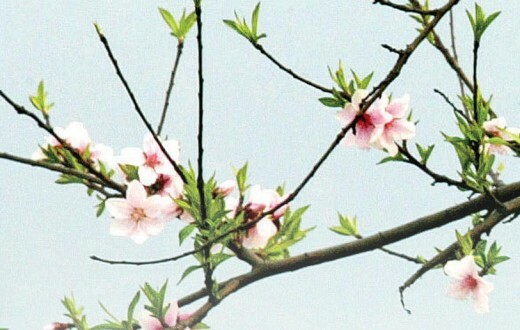 More than 80 years ago, Zhang Lu’an, the fifth generation director of Zhang Tongtai Pharmacy, a famous name brand in Hangzhou, China, bought an item for 300 silver dollars. In those days, one silver dollar could buy thirty-five to forty kilograms of rice, and the monthly salary of a county magistrate was only 20 silver dollars at most. The item that Zhang Lu’an bought was neither rare medicine nor expensive silk fabric; instead, it was just a little engraved seal. Called a “five-side seal” as it was carved on five sides, this seal’s carvings were characterized by mellowness and transcending elegance. It had been crafted by Deng Shiru, a luminary in the history of Chinese seal engraving and the founder of the Anhui school of seal engraving. Why is it that a little seal was able to inspire such admiration? This is because Chinese seal engraving is not just about engraving but rather is a perfect combination of calligraphy, composition and carving. Besides reflecting superb carving skills, a good seal is expected to create rugged or ethereally elegant calligraphic strokes composing an image that is a delight to the eye. On a “stage” that usually does not exceed 20 square centimeters, the artist can present a poem, lay out a drawing, tell a story, or relate an emotion. This is truly an art that is capable of “containing many a spectacle in a square inch”. The art of seal cutting has been rooted in all aspects of Chinese social life. 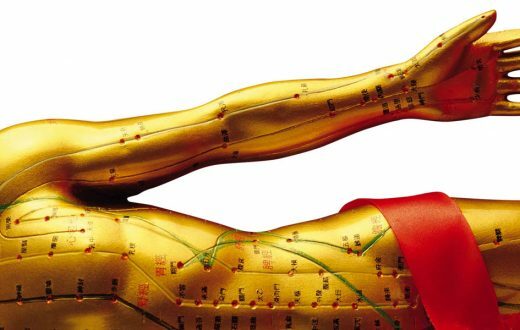 In fact, carving of words became popular over three thousand years ago, during China’s Shang dynasty (1765 – 1122 BC), an age when words were carved on animal bones, bronze and pottery. However, it was only when the seal script was introduced and widely adopted at the end of Qin dynasty (222-206 BC) and the beginning of Han dynasty (206 BC -220 AD) that seal engraving became a craft in its own right. It was also then that stones began to be used for this purpose. 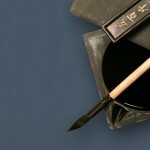 Since the seal script bears much resemblance to painting, it was the preferred script style for Chinese seal engraving craftsmen during that time. Later, as more and more men of letters and artists became interested in seal engraving and rendered it more expressive of feelings and personalities, other script styles were added, giving rise to various seal engraving styles, reflected in the Anhui and Zhejiang schools, which have existed since the Ming dynasty (1368- 1644). 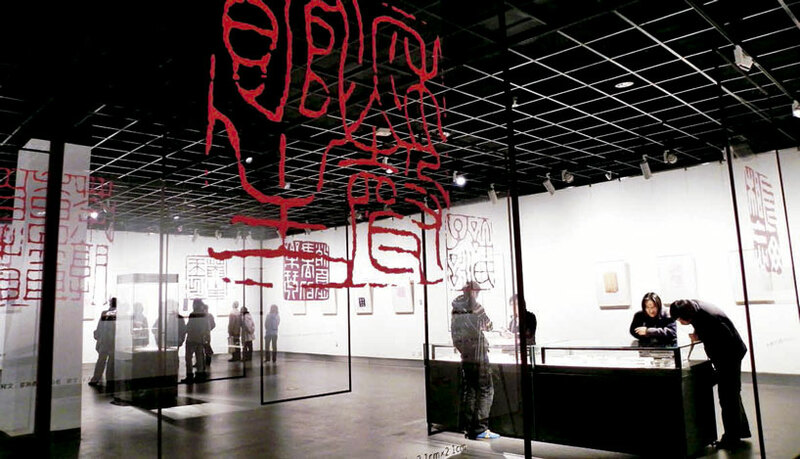 Today, Chinese seal engraving has become a unique art that presents itself in even more schools and styles. 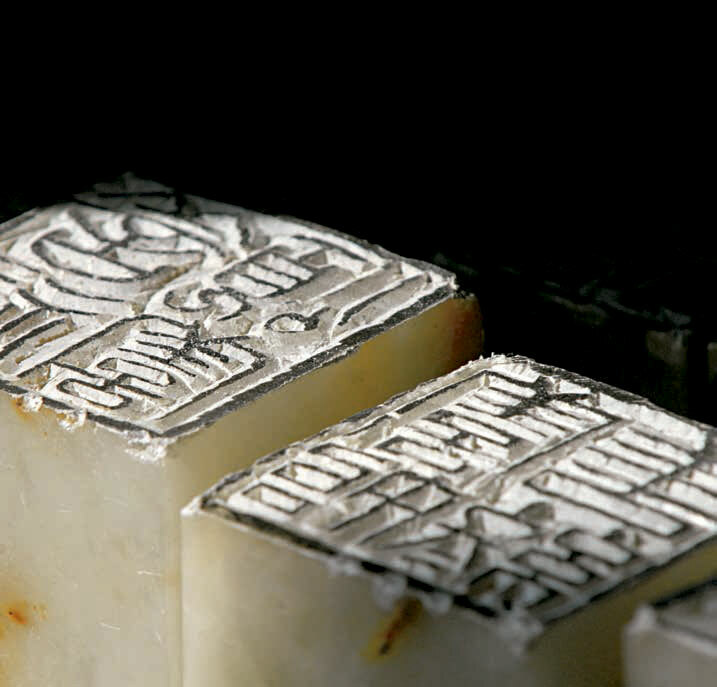 Besides reflecting superb carving skills, a good seal is expected to create rugged or ethereally elegant calligraphic strokes composing an image that is a delight to the eye. What makes seal engraving unique is the fact that, in addition to combining literature and aesthetics, engraved seals tend to be very expressive of their author’s personality, sentiments and feelings: Bold and forceful strokes ambitiously composed reveal an artist with heroic sentiments; exquisite strokes gracefully arranged bespeak attainment of inner peace. 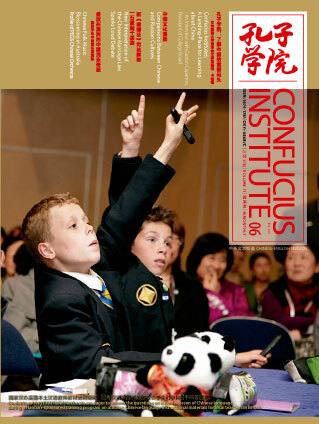 It is also believed that studying Chinese seal engraving can contribute to self-cultivation. A craft with a long history, seal engraving not only shows the aesthetic temperament of Chinese people but also is culturally rich. 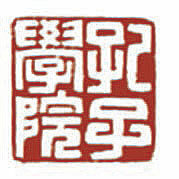 There are two types of Chinese seal engraving: zhuwen (red characters) and baiwen (white characters). 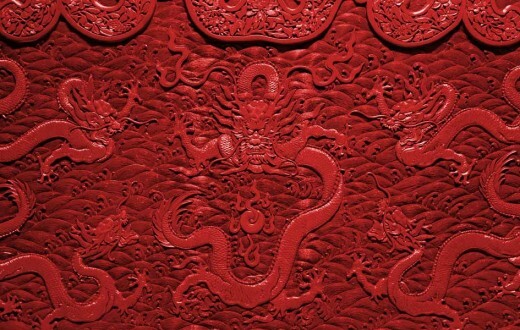 With zhuwen carving, what remains of the carved surface are the character strokes and the rim; so, using red seal paste and white paper, a zhuwen seal will imprint a red pattern with a white background. 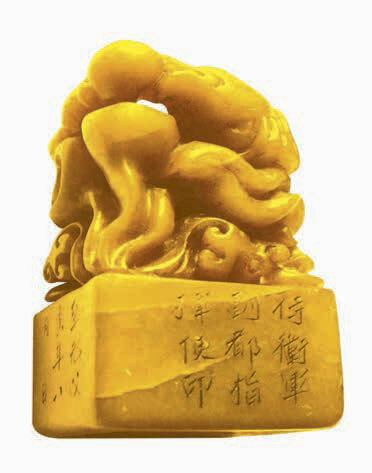 The baiwen carving is the exact opposite. 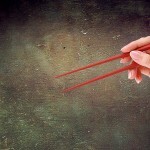 Chinese people call the remaining parts of the carved surface “solid”, as they will be clearly imprinted on the paper. The removed parts of the carved surface, on the other hand, are called “void”, as they will show on the paper as the blank background. Chinese Seal engraving is a process of realizing “solid” through the removal of “void”, a concept that fits well with the traditional Chinese philosophy of mutual promotion between solid and void and the oneness of yin and yang. 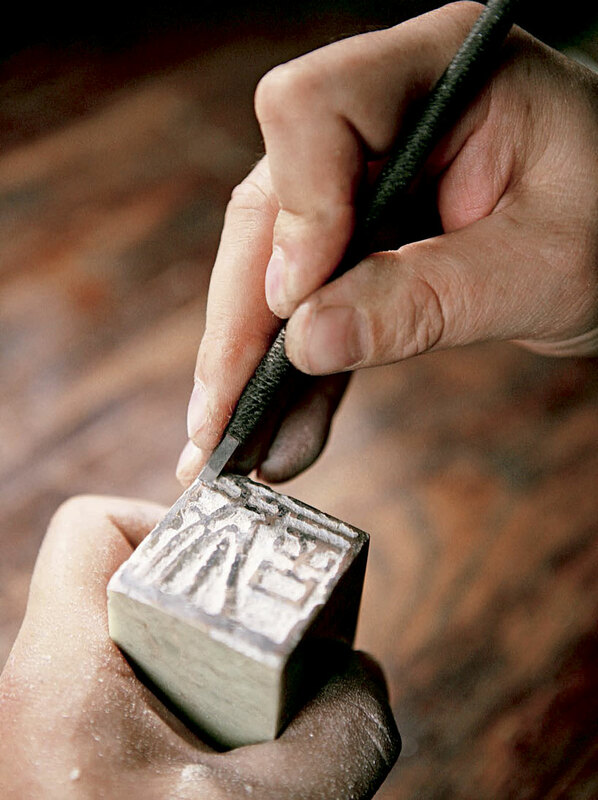 Since Chinese seal engraving is a crystallization of an engraver’s conception and the stone material used, it can be said that creation of a good seal depends as much on luck as on human effort. “I relish the grass that rims the mountain stream / While orioles sing in the trees above / Last night’s spring rain flooded the river / Which has the idling ferry boats tossed about.” In 28 characters, this poem vividly depicts a spring-time mountain scene, carrying a mixed sentiment of sadness and contentment. 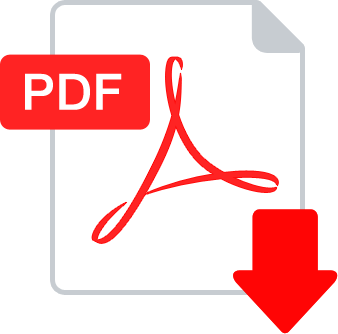 How would this same message be conveyed through a small seal? He Zhen, Ming-dynasty seal engraving virtuoso, captured the essence of this poetic scene on a square seal using only four characters: “ting lí shen chù” (quiet mountain wafting with oriole songs). Only four characters, but this image is instantly brought to your mind: An oriole is flitting and singing among the tree branches. You can only listen to it, for the lushness of the trees hides the bird from your view. 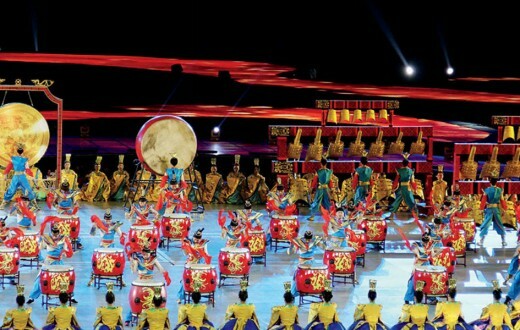 The Beijing Olympic emblem, “Dancing Beijing,” is derived from the Chinese seal art. A seal engraving can be a poem, and it can also be a kind of spirit. 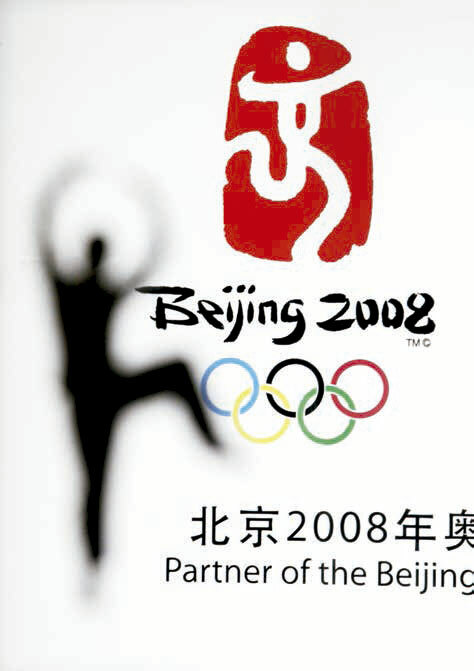 The emblem of the 2008 Beijing Olympics, the “Chinese Seal: Dancing Beijing” logo, was created using this traditional Chinese craft of seal engraving. The design of the emblem transformed the character “jing” ( 京, meaning Beijing) into the image of a person in a running pose, symbolizing to the whole world a China that is ancient and at the same time full of vitality.  According to the emblem’s designer, Guo Chunning, if you are looking for a traditional Chinese art that has all these qualities: uniqueness, symbolism, recognizability, freedom from language barriers, and artistic value, it will surely be the uniquely Chinese art of seal engraving. 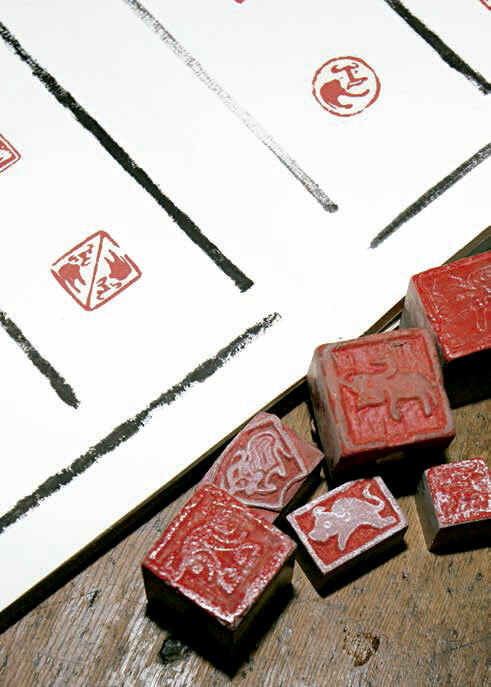 In 2009, “Chinese Seal Engraving” was included on the world “Intangible Cultural Heritage List”, becoming another valuable heritage that had won world recognition. In fact, over centuries of cross-cultural exchange and integration, seal engraving long ago spread to Japan, Korea and Singapore, where it has always enjoyed great popularity. Today, Chinese seal engraving is used not only for artistic appreciation but also in people’s daily life: it appears on tea pots, china ware, stamps, sculptures, and buildings. At the same time, it is no longer an art for the exclusive enjoyment of the literati, but has become also an amusement for many ordinary people. 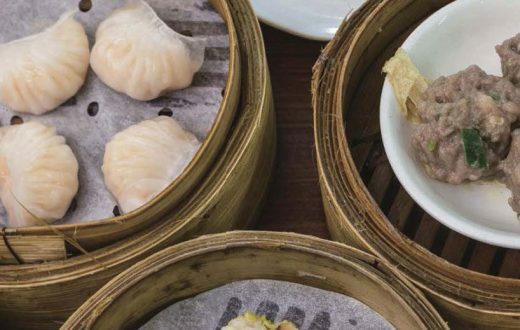 Any Chinese seal engraving enthusiast can pick up a stone and a carving knife and carve out a splendid series of life’s stories on tiny inch-squares. Magazine 17. Volume 6. November 2011.